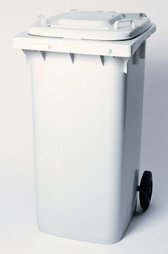 AEP presents a cart designed specifically for the document destruction market. AEP's attractive streamlined containers are easily maneuverable and fit through narrow doorways. The smooth surface, coordinated colors, and functional design allow for placement in any environment. Snap-On rubber wheels require no tools for attachment and allow containers to be quietly wheeled. Containers feature a tamper-resistent lock, reinforced lid, and slot with molded-in security flap. AEP containers are injection-molded from only the highest quality plastic resin. Durable and aesthetically pleasing in appearance, they are ideal for both indoor and outdoor use.